I just got my most recent order from Stampin' Up this week and I just have to share this fabulous die! Ladies, if you don't have a Big Shot you are missing out on some fun. 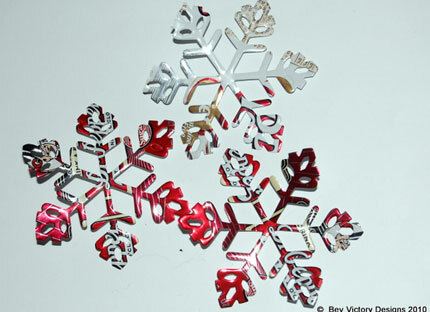 My last post showed the wonderful snowflakes I'm making with aluminum cans and now I just have to share some examples of this newest die "Tasteful Trim". This is a Bigz XL Die and so the cut out items are big! All four designs are 12 inches long, but you can make them shorter if you wish or you could double your paper or fabric not going all the way to the end and make them even longer, but now for the samples! 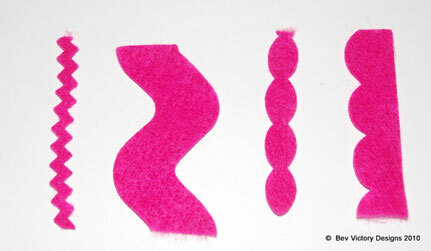 I just took about a four inch piece of felt and ran it through the machine so I could see the actual size and shapes. I love them! Whether you are using paper or fabric these are perfect pieces for embellishing your work. Hello everyone! If you wonder where I've been I've been playing with my Big Shot and attending the quilt show. Wow, have I been having fun with the Big Shot and instead of using paper, I've been trying out felt, fabric and aluminum cans! I've also been learning how to make silk paper (this will be showing up in a post soon) and organizing my craft room to make room for my new "embellisher" machine that should arrive before Thanksgiving! Today I'm going to show you some fun pictures of the aluminum can pieces. First I cut the top and bottom off of an aluminum can and cut it down the middle to make a sheet of thin aluminum. In fact, I was shocked at how thin it is - seems so strong when we're holding a can! But I regress, on to the fun stuff. Using the Snowflake #2 die I ran my aluminum through the Big Shot and look at what I got! I love them, I've now cut out about 20 and am looking for cans so I can make more. I think I'll have fun hanging them outside from a tree this year, but they would be beautiful inside too! Much depends on how many more cans I can find, donations are welcome. Intrigued, I also tried running an embossing folder through the Big Shot with a piece of aluminum in it and got a wonderful snowflake impression. I cut this out with the craft and rubber scissors and colored with alcohol ink. The printed side of the aluminum can is shown on the right. This made me want to try even more so I tried two punches - a leaf and the Stampin' Up ornament and yes they both punched the aluminum like it was paper! I colored both of these with alcohol inks too, just to see how the inks worked on the aluminum! I love how you can use multiple colors and they float into each other. Moving on, next I ran a piece of aluminum through the Big Shot with a texturz plate and then used the flower folds die to punch it out. Wow did I have fun! These are just samples so I haven't colored them carefully or figured out exactly what to do with them, but the possibilities are endless. Now it's your turn - try something new, you might be surprised by the results.